Painters are professionals who prepare surfaces to be painted, and then apply the right product to them. Many people learn this trade through an apprenticeship program, which involves several months of practical on-the-job experience under the direction of a more experienced craftsman. In order to become a painter, one must have at least a high school diploma and be able to read and speak English fluently. An applicant should also be of good character, since he or she will be going into private residences in order to perform this work. Those who wish to become self-employed contractors should have a good driving record, since they will be required to travel from one job site to the next. Painters must also be able to stand for extended periods of time, climb ladders and scaffolding, and stoop and bend frequently. In order to be successful in this line of work, individuals should have an eye for detail. They should also be patient and not try to rush through their work, as this can affect the overall quality of a job. Those who have a knack for determining which colors go well together will do well in this line of work, as consumers often ask painters for advice when they are choosing shades for a particular area. As such, painters should not be colorblind; otherwise, they could apply the wrong hue to a surface without even realizing it. Most people become painters by completing an apprenticeship program. The International Union of Painters and Allied Trades offers apprenticeship programs through a number of union contractors around the country. Those who are interested in an apprenticeship can often find one by contacting this group. Individuals who are between 16 and 24 years of age can sometimes obtain this training at a local Job Corps training center. An apprenticeship program can take anywhere from three to four years to complete. A successful year of training will involve at least 2,000 hours of on-the-job experience along with 144 hours of formal instruction. Some of this formal instruction will include things such as how to care for equipment, choosing the right instrument for the job, the differences in various types of paint or stain, and the process of mixing colors together. 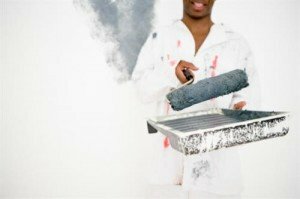 Many times, painters can continue working for the same contractor that allowed them to complete their apprenticeship program. Other times, workers may decide to start their own painting service once they have become proficient at this trade. Individuals can look for available positions by contacting union halls, decorating services or other painting contractors. In many cases, this type of work is primarily seasonal, since outdoor painting cannot be performed during the winter months. According to the Bureau of Labor Statistics, the demand for painters is expected to grow by around 18 percent before the year 2020. That is about average when compared to all other occupations. This increase in demand is due to the fact that trends in color are constantly changing, which means that new paint must continuously be applied. An increase in the number of real estate investors is also thought to spur growth in this career field. Several openings are expected due to people who are leaving the workforce because of retirement or disability. The work of a painter can sometimes be physically demanding; however, it is virtually stress free. In fact, many painters find their work to be somewhat therapeutic in nature. Painters help improve commercial and residential properties alike, making them a valuable asset for any property owner to utilize.